"Stop arsing around and just change the channel!" 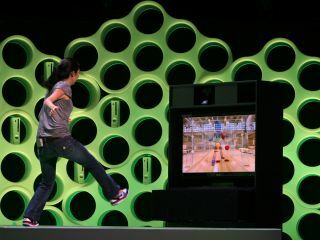 It has been confirmed that Sky Player on the Xbox 360 will indeed work with Kinect – Microsoft's new-fangled motion controller – when it launches in the UK. Microsoft has always been adamant that Kinect is not just about gaming, but an entirely new way to control everything on your console, which includes services like Sky Player. While there has been little word on how exactly this will be done, both Sky and Xbox have finally confirmed that you will be able to choose to watch your favourite shows by doing some Minority Report-style hand gestures. According to those in the know, you will also be able to use your voice to pause, fast forward, rewind and play content and scrolling through content will be done with the wave of a hand. Sky Player has been available on the Xbox 360 since October 2009 and marked a departure for Sky, as it offered the service to those without a satellite dish and not on a computer. Microsoft has announced that the UK release date for Kinect is 10 November, so get practising those hand gestures (not those ones! ).